Roanoke Vineyards Hosts its Own "March Madness"
With events like The Judgment of Riverhead and its "Smackdown" series, Roanoke Vineyards has been putting on some of the North Fork's more interesting winery events for a while now. These are events that are easy to appreciate and enjoy -- for both the creativity behind them and the fact that they aren't all about Roanoke Vineyards wines. On Saturday, sixteen local wine lovers -- including fellow bloggers/journalists -- Henry Powderly and Michael Gorton -- competed in the "March Madness Smackdown Tournament" a bracket-style blind taste-off for a seat on the expert panel at the April 2, 2011 edition of Smackdown. If you're unfamilar with the Smackdowns, they are an hybrid event-contest that asks a panel of Long Island winemakers, vineyard owners and experts to taste a series of wines blind and try to identify them. The person able to identify the most, wins, but non-panel attendees simply get to taste the same wines as the experts. The winner of the tournament was Andrew Rockwell, Laboratory Director at Premium Wine Group (pictured right), who also happens to be crafting a 2010 cabernet franc of his own -- but that's another story for another day. Andrew will join a panel that already includes Kareem Massoud, winemaker at Paumanok Vineyards, Kelly Urbanik, winemaker at Macari Vineyards, Tracy Ellen-Kamens of Grand Cru Classes and Louisa Thomas Hargrave, who co-founded Long Island wine country with Hargrave Vineyard. I'm hoping to attend myself...with a big "GO ANDREW" sign in tow. Next Saturday, Roanoke Vineyards will host "The Judgment of Riverhead" a tasting that is modeled, quite obviously, after "The Judgment of Paris." Top wines from California and France -- wines scored 90 or higher by The Wine Advocate or Wine Spectator, from $40 to $140 -- will face off against top wine from Long Island in a blind tasting. The wines will be tasted by a panel of nine wine and restaurant industry professionals -- including yours truly -- using a 20-point scale, just like at the original 1976 event in Paris. A group of 55 attendees will also taste and score the wines during the sold-out event. Those scores will be tallied separately. In all, we'll be tasting 18, including nine chardonnays (three from each region), and nine reds, focusing on Bordeaux varietals (again, three from each region). Tastings like these are always educational and fun. And while I'm sure some will interpret the results to mean more than they do, I consider it an honor to take part. More than anything, I'm looking forward to tasting with, and learning from, a great group of judges that includes Michael Cinque, retailer, Amagansett Wines and Spirits, Louisa Hargrave, co-founder of Hargrave Vineyard, Michael Kaminski, sommelier and director, Luce and Hawkins, Kareem Massoud, winemaker at Paumanok Vineyards, Mike Mraz, owner and beverage director of the North Fork Table and Inn, David Milligan, former president of Seagram, Chateau & Estate Wines Co., and the author of "All Color Book of Wine", Tom Schaudel, author, executive chef and owner of A Mano Oysteria and Coolfish restaurants, and Christopher Tracy, winemaker and co-owner, Channing Daughters Winery. Check back after the event for at least a post or two -- and maybe even some video -- about the event. HARVEST East End, last weekend's two-day celebration of Long Island wines and foods organized to raise money for East End Hospice and the Peconic Land Trust, was an absolute success by any measure. Congratulations are due to everyone involved in putting the event together, including the Long Island Wine Council, the Long Island Merlot Alliance (LIMA) and presenting sponsor, Wine Spectator. Pulling so many wineries, restaurants and people together is a challenge -- and it was met expertly. Donnell Brown, executive director of LIMA and event director for HARVEST, told me an email "HARVEST was a success because so many people believed in it, and helped to make it happen. Our two charity beneficiaries worked together beautifully, and were deeply involved in planning. The wineries responded to the idea of HARVEST with enthusiasm, and all put their best foot forward for this landmark event It truly was -- and is -- an event whose time has come." I wasn't able to attend any of the Friday night dinners or the Wine Salon events durin the day, but I've heard nothing but great things about them so far. If you attended any of those sessions, I'd love to hear about them, so please do leave a comment below. I haven't heard exactly how many tickets were sold for the grand tasting, which I did attend, but the tent was packed (as you can see at right) and yet comfortable. Anyone who has been to these types of events will tell you that they can get uncomfortable and overcrowded easily, but the space, set up and flow worked really well. I didn't get to anywhere near as many tables as I wanted, but several wines stood out for me on the afternoon, including Channing Daughters Winery 2009 Scuttlehole Chardonnay and 2008 Meditazion, Jamesport Vineyards 2007 Petite Verdot, Martha Clara Vineyards 2009 Sauvignon Blanc and 2008 Viognier, Mattebella 2008 Chardonnay, and Roanoke Vineyards 2009 Rhyme & Meter Chardonnay. As the sun set over the vineyard, we funnelled out of the grand tasting tent and over to two others for the gala and wine auction where we enjoyed a three-course meal cooked by North Fork chefs Keith Luce of Jedediah Hawkins Inn and Gerry Haydena and Claudia Fleming from North Fork Table, while drinking some of the region's top wines, including Bedell Cellars 2007 Musee, Pellegrini Vineyars 2005 Reserve, Throughout the meal, auction lots were presented, bid upon and sold, with some going for $10,000 or more. A final number is expected this week, but $75,000 was raised during the live auction. For me though, the best part was seeing so many members of the local industry in one place, drinking wine, eating local food and having a great time -- together. For at least one evening they were able to -- in the middle of harvest, some having processed fruit all day) -- set aside the business aspect of their wineries and celebrate the local bounty as a local wine community. It was as inspiring as it was fun. Long Island deserves an event like this, but I also think it needs one like this. In describing the importance of this event, Brown said "Its importance to the wine region was mainly in its tone. It was a demonstration that Long Island wines are worthy of a dedicated live auction and a sophisticated classy event." Planning for HARVEST 2011 begins next week, but in the meantime, the entire region should be proud. There are still a few days left to purchase your tickets to the NYCR's Angelman Syndrome benefit at Roanoke Vineyards this Sunday at 1 p.m. I may go broke bidding on these lots, but remember that all proceeds from the event will be donated to the Angelman Syndrome Foundation. Thank you each and every one of our donors for your extremely generous donations. To purchase your ticket, please call Roanoke Vineyards at 631.727.4161 to reserve your spot, as we have very little space left. Don't forget about our Angelman Syndrome benefit at Roanoke Vineyards on September 12. You can learn more aobut Angelman Syndrome but there isn't a cure today and as with many other syndromes, diseases and disorders, there is never enough money to fund research. We'll be hosting a wine tasting event at Roanoke Vineyards on Sunday, September 12, 2010 from 1 - 5 p.m. to raise money that we'll donate through the Angelman Syndrome Foundation). Shinn Estate Vineyards will also be taking part in the event as our guest winery. Tickets are $35 and have been selling better than I ever expected. Your ticket includes a side-by side tasting of two of my favorite -- and long sold out -- 2005 merlots: Roanoke Vineyards 2005 Merlot and Shinn Estate Vineyards 2005 Nine Barrels Merlot. We'll have cheeses and other nibbles from the Village Cheese Shop in Mattituck and Shinn Estate co-owner and chef David Page will no doubt add something tasty to the menu. Response from the New York wine and associated industries has been humbling with several wineries donating half and full cases of wine for our auction. Restaurants have donated gift certificates as well. If you're a winery, brewery, restaurant or other business and are interested in donating something, please email me. There might be a war brewing -- or perhaps fermenting -- in Long Island wine country. It pits local wineries against local government -- specifically Town of Riverhead and Town of Southold. The issue is a complex one, but the recent skirmish centers on the various events that local wineries are using to draw crowds -- and their tourism money -- to the East End. Are these events within local codes? It depends on who you ask, but a handful of wineries received cease and desist notices recently for things like serving oysters in their tasting room, pouring wine at a local farmstand and having fitness classes in their vineyard. And, as you may have read, this weekends NOFO Rock and Folk Festival has come under scrutiny as well. The Fest is something that I've been looking forward to for some time -- a family friendly day-long event in wine country that combines two of the Thompson family's favorite things: wine and music. According to Jim Silver, general manager of Peconic Bay Winery where the two-day festival will take place, organizers went through all of the proper channels from the beginning "We submitted our request for a permit to the Zoning Board of Appeals, and it was approved quickly," he said, adding "There are concerns in and amongst the community that the size and scope of the festival is greater than anyone anticipated, but we have effectively addressed any concerns raised and are confident that the NOFO will be a success on every level and result in a positive for the community." The winery has invested the time (and money) to fence off the areas that border their neighbors and made eight acres of open space available for parking. "The police and the town have been briefed extensively on our plans as well and the Southold Town police have been particularly helpful," Silver said. "I think everyone understands that this is a quality event, well planned and designed for peaceful music lovers and supporters of cultural events." Lost in the misinformation flying around about the event is the fact that it will benefit the East End Arts Council, a great organization that was chosen because it "supports musical education projects for children" according to Silver, who wouldn't quote a dollar figure or percentage for the contribution, only saying that it will be a "meaningful contribution." I'm planning to spend Sunday at Peconic Bay Winery enjoying gorgeous weather, great music and an even better time with my family and friends. If you're going, let me know and we'll have a glass of wine or a pint of beer together. Amidst the sea of wine drinkers that accosted me and my fellow vendors (I was pouring for Freedom Run Winery) at the Finger Lakes Wine Festival this weekend, I managed to make my way to my own personal oasis: the Brewers Garden. Purposely tucked away behind the main festival proceedings, the small cluster of beer tents cost a $10 admission fee to both guests and vendors -- irritating, yes, but once I got in I realized that maybe the fee was a good thing. Lines were short and the drunk “dudes” normally present at beer festivals all seemed to be congregating at the Red Cat tent. After purchasing my ticket and refusing to let the rather snappy Brewers Garden bouncers dampen my spirits, I discovered a small but solid collection of beer vendors serving up friendly attitudes and solid beers. My $10 got me a beer sample glass and a bracelet with tabs for eight fills. Sierra Nevada, Anchor and Victory represented the non-NY contingent, and macro brands Dundee, Michelob, Kona and Budweiser were present, but I zeroed in on Rooster Fish, Lake Placid, Saranac, and Brooklyn. Ommegang and Southern Tier were on the program but must’ve run out of beer by the time I made it on Sunday afternoon. These breweries weren’t messing around. Though I spent plenty of time at Watkins Glen’s own Rooster Fish brewpub over the course of the weekend, I stopped at their tent for the excellent Hop Warrior Imperial IPA and Summer Sky Hefeweizen. Lake Placid went big with Honey Rye and the flagship brown ale Ubu, with sister brewery Saranac supplying the fruitier Pomegranate Wheat. Brooklyn poured a refreshing batch of its signature Lager and was bold enough to offer the Black Chocolate Stout as well. Sure, it was 85 degrees out, but that stout was a great pairing for my cocoa-spiced glazed almonds from the Banana/Nut guy. It was great to see the New York beers showing so well, and with comfortable tables in the Brewers Garden and some great live music throughout the weekend, it was a welcome, low-key break from the chaos of the wine tents. My favorite beer experience of the weekend, however, wasn’t at the festival. It was at the bar at Seneca Lodge Motel and Restaurant. The homey, hopping bar (pictured right) serves up its own house beers, and they’re delicious. The Porter is wonderfully roasty with a nice hop kick in the finish, but the Ale is my favorite; a nose of fruity banana esters and a peanut butter/caramel malt explosion on the mouthfeel make it slightly sweet and creamy but refreshing with low carbonation and a nicely balanced finish. Both are complex yet sessionable and great matches for the ribs, barbecue and burgers being served in the restaurant. Brett Brubaker has been brewing the house beers for his family’s restaurant only since April of this year, but he’s been homebrewing for years and shows an obvious appreciation for simple, easy-drinking brews made with care and a sense of balance. Ideal for a summer vacation on the lake, the Seneca Lodge beers were a surprising treat and truly hit the spot after a hot day at the festival. If you’re in the area on holiday and need a break from a marathon of wine tasting, don’t forget to seek out some delicious local beer -- Central New York was the original center of the American beer world, and it’s clear that several talented brewers are keeping the tradition alive. "I'm not ready to give up riesling to our friends up north." That's how Jim Silver, general manager at Peconic Bay Winery, kicked off a recent vertical tasting of ten Peconic Bay Rieslings for a group of 30 or so wine club members and a few press folks. By "friends up north" Silver was, of course, referring to wineries in the Finger Lakes, where this country's best rieslings are born. Vineyard-wise, the Finger Lakes are still dominated by hybrids, and even natives like Concord, but most of the best wines there are made with riesling. It's the future of the region and what will continue to build it's reputation in the wine world. Here on Long Island, riesling is a bit player, a character actor that will never take center stage in any sort of meaningful way. It's warmer here -- good for merlot and other Bordeaux red varieties -- but not neccessarily good for riesling. Add elevated humidity of a maritime climate and you'll understand why riesling isn't more prevalent on Long Island. That all said, there are some good rieslings being made locally and Greg Gove, winemaker at Peconic Bay Winery, consistently crafts one of the best. The wines change stylistically from year to year depending on the growing season, but Gove's dedication to riesling is apparent. Clearly, he enjoys working with it, despite the challenges. As he led us through the ten vintages of riesling, from 2000 through the not-yet-released 2009 bottling, the beauty of riesling and vintage variation was on full display. That's one of the real treats about riesling -- it is so transparent, making it a clear looking glass into place and weather. Each of the ten wines was a treat, but a few certainly stood out (I've marked those with a * below). Peconic Bay Winery 2000 Riesling: Peach, honey and orange marmalade on the nose with an intense minty-herbal quality and petrol. Soft and tongue-coating on the palate with more orange marmalade, cotton candy and minty herbs. The acidity has faded, but the flavors remain. Peconic Bay Winery 2001 Riesling: Less intensely minty with fresher, brighter fruit character - citrus, pear and peach. Still a nice bit of acid on the finish, along with understated minerality, petrol and honey. Peconic Bay Winery 2002 Riesling: Maybe my least favorite of the group. Nose is a little muted. Mostly citrus, primarily grapefruit, with some blanched almond and petrol. Peconic Bay Winery 2003 Riesling*: Honey and nuts lead the nose with intense lemon-lime citrus aromas. Bright and citrusy on a broad, mouth-filling palate with youthful acidity and lingering nuttiness. Peconic Bay Winery 2004 Riesling*: Leaner, but more focused and extremely lively with peach, citrus and minerality. Long, dry finish and bright acid. Plenty of time left in the bottle. Peconic Bay Winery 2005 Riesling: Another of my least favorite. Lots of petrol, orange, grapefruit and papaya with low acidity and a short finish. Peconic Bay Winery 2006 Riesling*: Classic with great balance of fruit, residual sugar and acidity. Floral with great fruit intensity -- peach and sweet lime -- and still-fresh acidity. Peconic Bay Winery 2007 Riesling: Ripe, Meyer lemon and grapefruit with a little peach. A little petrol too. Surprisingly balanced for the hot growing season. Something on the nose that I thought might be VA but Gove thought it was from sulfur at bottling. Peconic Bay Winery 2008 Riesling: Citrus blossom, lime and white peach character wrapped up in great acidity with just a touch of residual sugar. Refreshing and clean, if a little austere. Peconic Bay Winery 2009 Riesling**: Grapefruit, citrus blossom, and juicy peach on the nose. Snappy and tastes dry because of big acidity. Just bottled, but already showing that it could be Gove's best yet. Need to re-taste at release. Driving home after the tasting, I couldn't help but feel lucky to have such diversity in our local wine industry. There truly is a wine for every occasion and palate here -- that can't be said about very many wine regions in the world. Expect a post about that soon. Harvest season is always bustling and fun on the East End of Long Island, but this year there is another (though expensive) reason to get out there -- HARVEST, a wine auction and celebration of Long Island's East End -- to benefit the Peconic Land Trust and East End Hospice. Organized by the Long Island Merlot Alliance and Long Island Wine Council with support from the New York Wine & Grape Foundation, HARVEST is happen September 24-25 at Wölffer Estate Vineyard in Sagaponack and at local vineyards on both forks. 7 p.m. – 11 p.m. 10-Mile Dinners. Single ticket $350. Ten dinners at 10 private locations—homes, yachts, gardens—with an unforgettable, locally sourced meal, each hosted by a top East End winemaker and regional chef. 10 a.m. – 2 p.m. The Wine Salon. Single ticket $25. Educational and intellectual programs spanning wine-making and tasting; cooking; sensory explorations and more. 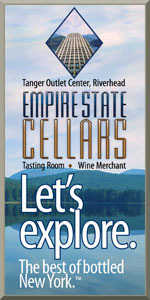 Programs will be held at wineries across the East End. 4 p.m. – 7:30 p.m., Festival Tasting of Long Island’s Bounty. Single ticket $125. Grand tasting of Long Island wines, including wines to be offered at auction. Small plates of local, seasonal dishes by East End chefs partnered with farmers and food artisans. Silent auction of regional treasures. Held at Wölffer Estate Vineyard. 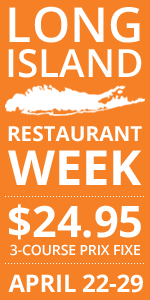 7 p.m. – 11 p.m., Gala Dinner & Live Auction of Long Island Wine. Single ticket $275. Ticket includes entry to the Festival Tasting. A world-class, farm-to-table dinner created by premier East End chefs Keith Luce, Gerry Hayden and Claudia Fleming. A live auction of Long Island wines and extraordinary experiences. Live music and dancing. Held at Wölffer Estate Vineyard. As you can see, it's not exactly a cheap date on the East End, but it promises to be a special occasion worthy of a splurge. Plus there are ticket packages that make the costs a bit more reasonable. You can read all the details about participating restaurants, chefs and wineries on the event site. Several weeks ago, it looked as though the NYCR would be a regional media sponsor and even organize a more moderately priced "wine bar" event to contribute, but then the organizers were lucky enough to have Wine Spectator sign on as "Presenting Sponsor" and, despite my best efforts, WS won't bend their rule about other wine publications not being allowed to sponsor their events. My feelings are mixed on that, of course, but ultimately what matters is Peconic Land Trust and East End Hospice. Check out the HARVEST site and keep an eye out for updates leading up to the event. One of my favorite annual Long Island wine events -- Brooklyn Uncorked -- is taking place on May 5 from 4 to 8 p.m. at the Brooklyn Academy of Music. For anyone who is interested in local wines, there is no better chance to taste and experience the diversity of Long Island wine. Plus, there will be great food from NYC restaurants to enjoy as you walk from table to table sampling some of Long Island's best vino. I won't be able to attend this year's event, but it really is a lot of fun and if you don't get out to Long Island wine country very often, you really shouldn't miss this event. Among those wineries that will be pouring are Bedell Cellars, Bouké, Channing Daughters Winery, Corey Creek Vineyards, Grapes of Roth, Jamesport Vineyards, Lieb Family Cellars, Macari Vineyards & Winery, The Old Field Vineyards, Shinn Estate Vineyards and Wölffer Estate. Restaurants and food purveyors who will be offering samples of food include Tanoreen, DuMont, Dressler, Txikito, Gramercy Tavern, Palo Santo, Stinky Bklyn, Savoy, D. Coluccio & Sons, Tipsy Parson, Liddabit Sweets, Watty & Meg, Good Fork, Orwasher’s Bakery, Katchkie Farm, Great Performances and Dallis Coffee. Another fun, the New York Wine Stand, a program that features New York wines at city Greenmarkets, will be pouring New York rieslings. Best of all, if you buy your tickets now (meaning before Sunday) tickets ($40) are buy one, get one half-off. An afternoon and evening of great local wines and food for $30 per person? It's a great deal. Full disclosure: Lenn and I were approached in the planning stages about how this project might work.We offered some basic feedback but removed ourselves from the process. An ambitious new collaboration will launch in April, and it unites New York State's three largest wine producing regions. The Three Sisters Project will link "sister wineries" from Long Island, the Hudson Valley, and the Finger Lakes. Each sister winery will sell one another's wine in the tasting room and will seek to educate customers about the unique qualities of the individual regions. The participating wineries are still finalizing the list of wines to be poured at each location. DeVito has said that if the project is successful, it's possible it will be repeated in the fall and in future years. But what will it mean to be "successful"? If participating wineries can sell one another's wines with regularity while providing new information for consumers about other New York regions, that will qualify. The theme fits the larger ethos that has become so pervasive in New York winemaking, which is the value of collaboration. In April we'll find out what kind of impact it can have on consumers.